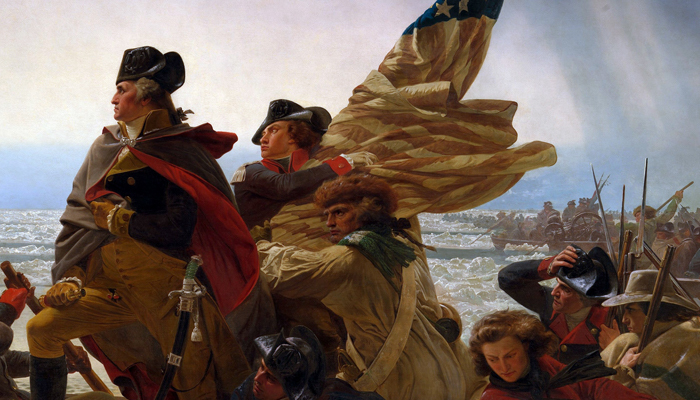 The closing months of 1776 had been dire for George Washington and the Continental Army. Most recently, the losses of forts Washington and Lee had been followed by a hasty retreat across New Jersey with the army of Lord Cornwallis in close pursuit. In early December, the Americans found temporary safety by crossing the Delaware River into Pennsylvania; those boats not used in the evacuation were destroyed, making it impossible for the British to follow until ice formed. Washington&apos;s army had lost more than half of its men to illness, desertion and enlistment expirations. The only thing normal about this Christmas Morning in 1776 was the smell of an abundance of food being prepared. Was General Washington planning a celebration? He was not! This little military encampment on the Pennsylvania side of the Delaware River did not have much to celebrate. They had just been through 4 months of defeat in this American Revolution. This included a grueling and harrowing flight across New Jersey that began with a midnight boat ride from Brooklyn on Aug 29th. Their joy when the statue of King George was torn down after hearing the Declaration of Independence seemed a memory too far recessed to be illuminated by any new Christmas light. Desperate for a victory, and aware that the term of enlistment for many of his soldiers expired at the end of December, General George Washington and his officers devised a daring plan to restore morale among his troops and his countrymen, and save his army. His plan: to cross the Delaware River on Christmas night, surround the 1,500 Hessian soldiers garrisoned the town of Trenton, New Jersey, and end the year on a positive note. After being driven out of New York by the British and forced to retreat to the West bank of the Delaware during the late summer of 1776, the American cause was at a low ebb. In the harsh winter Washington was faced with the annual crisis of the expiry of the Continental Army&apos;s period of enlistment. He resolved to attack the Hessian position at Trenton on the extreme southern end of the over extended British line along the Delaware, before his army dispersed. It was a critical time for George Washington. He had just been soundly defeated in New York and morale was very low. His writings to the Continental Congress tell us so. Although there was not much to be gained through a victory here in a territorial sense, it was one of the many crucial moments in the American Revolution. This victory was essential to give the soldiers hope that a group of rag-tag soldiers could indeed be victorious in their struggle for independence. In the fall of 1776, Washington was in desperate straits, having been defeated in Long Island, and having to retreat from New York City, which being surrounded by water, was found to be indefensible from the British with their naval mobility and larger force. Leaving most of the army under Major General Charles Lee, in Westchester, he crossed into New Jersey. Fort Washington on Manhattan Island was captured by the Hessians (mercenary troops from Germany employed by the British), and Fort Lee, opposite the Hudson on the Jersey shore, was about to be attacked. Washington ordered the stores removed and the troops to prepare for evacuation. Trenton was occupied by three regiments of Hessian soldiers commanded by Colonel Johann Rall for a total of about 1,400 men. Washington&apos;s force of about 2,400 attacked in two columns: Major General Nathanael Greene&apos;s division from the north, and Major General John Sullivan&apos;s division from the west. A third division never made it across the river because of the weather but was supposed to attack from the south. The Battle of Trenton (Dec. 26, 1776) was a crucial early victory for the American forces in the American Revolution. On Christmas night 1776, Gen. George Washington and about 2,500 Continental soldiers crossed the ice-clogged Delaware River from Pennsylvania; early the next morning they surprised Hessian mercenaries in the British service encamped at Trenton, N.J.
General Washington knew that he and the Rebel cause needed some momentum before ending operations for the winter.. He decided to cross the Delaware River back into New Jersey and make a surprise attack on the British forces which had already settled into winter quarters. He chose the remote Hessian garrison at Trenton commanded by Colonel Johann Rall . On Christmas Night, 1776, what has been immortalized as &apos;The Crossing&apos; took place in a snowstorm as Washington led his troops across the Delaware River and on to Trenton. George Washington knew that about 1,500 of the enemy, chiefly Hessians (Germans), were stationed at Trenton under Colonel Rall, who, in his consciousness of security and contempt for the Americans, had said, "What need of entrenchments? Let the rebels come; we will at them with the bayonet." He had made the fatal mistake of not planting a single cannon. The victory at Trenton astonished everybody, so closely had Washington guarded the secret of his intentions. As the news spread through the country the rejoicing was loud and unrestrained. The captured Hessians were marched through the streets of Philadelphia to give the people ocular proof of the American triumph.